Performers include: Arthur Darvill, Casper Crump, Brandon Routh, Caity Lotz, Victor Garber, Franz Drameh, Wentworth Miller, Dominic Purcell, Ciara Renée, and Falk Hentschel. This science-fiction action series is a spin-off of The Flash and Arrow TV series and features additional characters first seen in DC Comics comic books. Villainous Vandal Savage (Casper Crump) has been manipulating world leaders for 4,000 years in an attempt to rule the world. In the year 2166, he’s on the verge of his final victory — the utter destruction of humanity and time itself. As the world crumbles, roguish Time Master Rip Hunter (Arthur Darvill) takes matters into his own hands. He travels 150 years into the past to assemble a carefully selected team of heroes and rogues. Hunter chooses what seems like an ill-matched group. Sara Lance (Caity Lotz) is the White Canary, a trained assassin. Professor Martin Stein (Victor Garber) and auto-mechanic Jefferson “Jax” Jackson (Franz Drameh) fuse together to form the meta-human Firestorm. Leonard Snart (Wentworth Miller) and his partner Mick Rory (Dominic Purcell) are better known as known as Captain Cold and Heat Wave, a pair of career criminals. And finally, there’s Kendra Saunders (Ciara Renée) and Carter Hall (Falk Hentschel), who are really Hawkgirl and Hawkman. They are two souls who have been reincarnated many times, and who possess the ability to fly. They also have a spiritual connection to Vandal Savage. Convinced by Hunter that they’ll one day be known as “legends” if they join him to defeat Savage, the group travels back and forth through time to try to stop Savage’s evil plans from being set into motion. Meanwhile, Hunter struggles to keep to his duty as a Time Master and avoid irreparable damage to the timeline of history. The fate of the world is in the hands of this unlikely team, and the battle to save Earth will be legendary. What do you think? Do you like the DC’s Legends of Tomorrow TV show? Do you think it should be cancelled or renewed for another season? 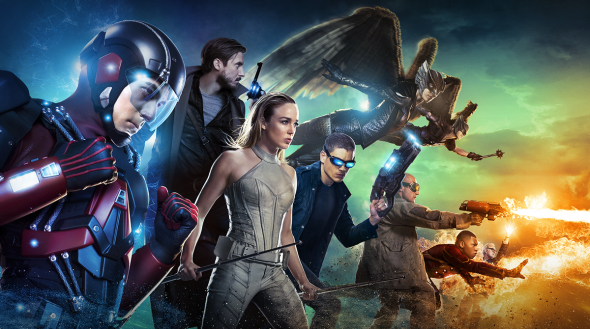 DC’s Legends of Tomorrow: CW Series Premiere Date Revealed? I’ve watched all the episodes to date, but feel that the series has become so ridiculous that I may drop it going forward. And I don’t say that lightly because I really drop a show that I’ve started. I meant to say rarely not really. Great show .Hope we get a new season 4 .plus some more seasons as well. Please keep it going-it’s one show my husband and I agree on watching together! Great show-look forward to watching it!